When negligence causes accidents and serious injuries, injured people can turn to the experienced Secaucus personal injury lawyers at Maggiano, DiGirolamo & Lizzi, P.C. for superior advocacy and justice. With more than 90 years of combined legal experience, our attorneys know how to effectively represent our clients in any type of personal injury claim. Our focus is on serving our clients’ needs, protecting their rights and interests, and fighting to secure the best possible resolutions. Call us today. Let us tell you more about your rights and your options. We can help. While we invite your calls and emails whenever you are ready to learn more about a possible case, we also welcome you to explore the following for some helpful questions that can reveal more about your recovery options and how choose the right attorney for a claim. When, where and how did the accident occur? – This can get you ready to discuss the details of the incident that caused your injuries. What happened after the accident? – Namely, were the police called? Was the incident reported to any authorities? Did you seek emergency medical treatment? These answers can uncover more about the available evidence (like police or accident reports) and the damage caused by the accident. Were there any witnesses? – If possible, try to have the name(s) and contact information for any witnesses ready to share with an attorney. If that is not feasible, being able to share any information you have regarding the witnesses can also be helpful. Did any party admit fault for the accident? – Or did any involved party apologize for the incident? Apologies may be implicit admissions of fault in some cases. Did I play a role in causing the accident? – Even if your actions may have contributed to the incident and injuries, you can still be eligible for financial recovery under New Jersey law (as long as another party is found to be more at fault for the accident than you were). When did I seek medical care and what treatments have I received since the accident? – This answer will reveal more about the extent of your injuries and the nature of the damages you may be entitled to. What interactions have I had with insurers regarding the accident? – Did you report the incident to an insurance company? Have you spoken to or met with an insurance adjuster? Have any insurers sent you any letters, emails or other correspondence regarding the accident? These answers can shed light on the status of your potential claim and the next steps that need to be taken to protect your rights moving forward. These questions can help you gain a better understanding of an attorney’s background and practice and whether that lawyer is the right professional to represent you moving forward. How much experience do you have with cases like mine? – It’s not enough for a lawyer to practice personal injury law. The attorney must also specialize in handling cases similar to yours. What will you do to get my case started? – This is meant to reveal whether an attorney plans to immediately start working on your case. Listen for specifics here. Will you be handling my case throughout its duration? – Or will my case be passed off to someone else (like a non-attorney associate)? Be cautious about retaining a lawyer who plans on passing your case off to a non-lawyer associate. How and when will I be updated about the status and progress of my case? – And how responsive will you be to my inquiries about my case? Think about your expectations for case communications, and see if an attorney plans to meet or exceed those. What are your fees? – Do you charge a flat fee? Do you work on contingency? Can I see a fee schedule? Make sure the question of fees is clearly answered up front so you know exactly what to expect in terms of legal fees before you sign a retainer agreement. Do you have references who I can talk to? – An established lawyer with a good track record will generally be willing and ready to provide references that you can contact and speak with in regards to the quality of their service and representation. Why are you a better option than other attorneys I may be considering? – An experienced attorney will have a good answer to this question. For instance, (s)he may provide some specific examples of similar cases that (s)he has successfully settled for previous clients. 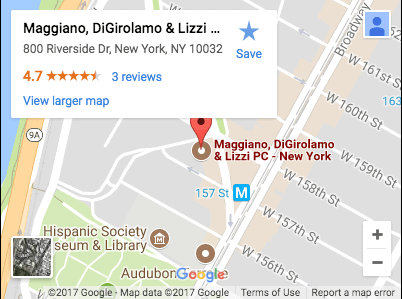 Let Us Tell You More About Your Options & How We Can Help: Contact a Secaucus Personal Injury Lawyer at Maggiano, DiGirolamo & Lizzi, P.C. Call (201) 585-9111 or email us to talk to an experienced Secaucus personal injury lawyer at Maggiano, DiGirolamo & Lizzi, P.C. We are ready to partner with you and level the playing field as you seek the financial recovery and justice you deserve. Our ongoing commitment to our clients and our record of success in personal injury claims have earned us many professional recognitions and positive testimonials from past clients. Secaucus is home to the headquarters for various sports-related companies and associations, including the National Basketball Association (NBA), NBA TV, the Major League Baseball (MLB) Network and Major League Lacrosse (MLL). Several other businesses are also headquartered in Secaucus. In 2016, Secaucus was ranked as the best New Jersey city for entrepreneurs.